This weekend’s key matchups are underway with with #16 LSU taking game 1 against #9 Cal State Fullerton. Danny Hultzen was once again dominant as #10 UVA knocked off ACC rival #12 Clemson. #11 Arizona State was victorious over #25 Auburn. Gerrit Cole – RHP – UCLA – Jr. 7IP 3H 3ER 1BB 12K. UCLA having some series issues scoring runs. Jake Barrett – RHP – Arizona State – So. 5.2IP 5H 6ER 3BB 7K. Kurt Heyer – RHP – Arizona – So. 8IP 5H 1ER 1BB 11K. (W, 3-1). Madison Boer – RHP – Oregon – Jr. 7.2IP 5H 1ER 5BB 6K. Andrew Triggs – RHP – USC – Jr. 6.1IP 7H 2ER 3BB 3K. Adam Conely – LHP – Washington St. – Jr. 8IP 4H 0ER 0BB 9K. Sonny Gray – RHP – Vanderbilt – Jr. 7IP 2H 0ER 3BB 9K. (W, 4-0). Brian Johnson – LHP – Florida – So. 7IP 6H 3ER 1BB 5K. (W, 4-0). Michael Roth – LHP – South Carolina – Jr. 8IP 5H 0ER 1BB 9K. (W, 4-0). Cory Luckie – LHP – Auburn – Jr. 4.1IP 9H 3ER 0BB 8K. Taylor Rogers – LHP – Kentucky – So. 7IP 7H 2ER 1BB 5K. (W, 1-1). Taylor Jungmann – RHP – Texas – Jr. 8IP 3H 0ER 2BB 4K. (W, 4-0). 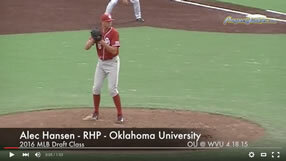 Michael Rocha – RHP – Oklahoma – Sr. 7IP 3H 2ER 2BB 5K. (W, 4-0). John Stilson – RHP – Texas A&M – Jr. 6IP 6H 3ER 3BB 1K. TJ Walz – RHP – Kansas – Sr. 6.2IP 6H 2ER 1BB 10K. (W, 3-2). Logan Verrett – RHP – Baylor – Jr. 9IP 1H 0ER 1BB 14K. (W, 3-1). Danny Hultzen – LHP – Virginia – Jr. 6.2IP 5H 0ER 3BB 14K. (W, 4-0). Hultzen has been so dominate this season. And this outing came against division rival #12 Clemson. Sean Gilmartin – LHP – Florida St. – Jr. 7IP 2H 1ER 1BB 11K. (W, 4-0). Mike McGee – RHP – Florida St. – Jr. 1IP 0H 0ER 1BB 2K. (S, 3). Scott Weismann – RHP – Clemson – Jr. 6.2IP 8H 3ER 2BB 3K. Patrick Johnson – RHP – UNC – Sr. 5.2IP 3H 0ER 3BB 9K. (W, 3-0). Cory Mazzoni – RHP – NC State – Jr. 7IP 6H 1ER 4BB 8K. Mark Pope – RHP – Georgia Tech – Jr. 9IP 4H 0ER 0BB 6K. (W, 4-0). Produced the exact same line two weeks in a row. He’s performed as well as any pitcher in the nation. Tony Zych – RHP – Louisville – Jr. 1IP 1H 1BB 0K. (S, 5). May be the nations best closer. Elliot Glynn – LHP – Connecticut – Sr. 6IP 5H 3ER 2BB 4K. Kyle McMyne – RHP – Villanova – Jr. 7IP 7H 2ER 2BB 8H. (L, 2-2). Kyle Winkler – RHP – TCU – Jr. 6H 3H 0ER 1BB 7K. (W, 4-0). Austin Kubitza – RHP – Rice – Fr. 6IP 6H 2ER 0BB 7K. (L, 1-2). Tough loss to Long Beach State. Anthony Meo – RHP – Coastal Carolina – Jr. 6.1IP 7H 2ER 3BB 5K. (L, 1-2). Lost a battle of potential 1st round picks against Kent State’s Andrew Chafin. Noe Ramirez – RHP – Cal State Fullerton – Jr. 7IP 6H 4ER 2BB 9K. (L, 2-2). Andrew Gagnon – RHP – Long Beach State – Jr. 8IP 6H 1ER 1BB 6K. (W, 2-2). Ryan Carpenter – LHP – Gonzaga – Jr. 4H 7H 6ER 3BB 5K. (L, 0-1). Carson Smith – RHP – Texas State – Jr. 7IP 7H 1ER 3BB 10K. Andrew Chaffin – RHP – Kent St. – So. 7IP 4H 0ER 2BB 6K. Against Anthony Meo and a good Coastal Carolina team.